Popular reality show Bigg Boss season 11, is high on fights these days. One day after the other, everyone gets a topic to fight with each other that clearly signifies that they cannot live with each other under the same roof peacefully. There is one such person inside the house, who has fought with people, ever since he has entered the house. Ever since he has entered the house again, he has been landing into troubles one after the other. First he got too personal and said a lot of things in the house that had led him to a legal trouble outside the house. In the last night's episode too, he said something that has offended a lot of people. 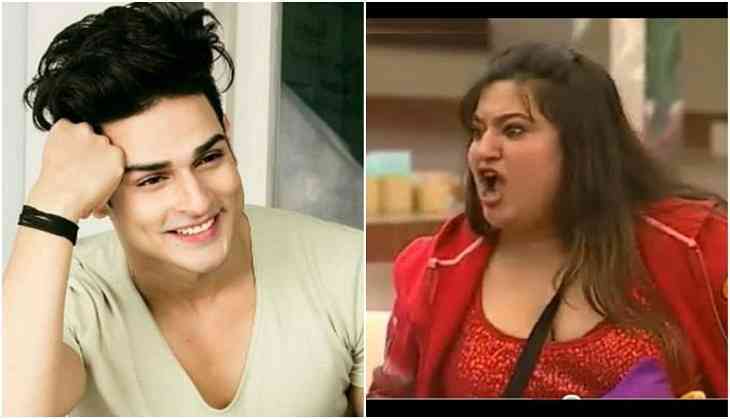 During a conversation conducted between Priyank Sharma, Hina Khan and Luv Tyagi, Priyank was seen making comments on Arshi Khan and Shilpa Shinde, who at the present, are his rivals at this moment. During the conversation body-shamed both of them and called them 'drum' and 'saand'. During the conversation, he said that they both will not be able to complete or perform any tasks because they have gained so much weight by sitting in the house and have become like drums and saands. People also slammed Hina Khan for not even stopping him or telling him that he has said wrong. However, Luv, during the conversation told him twice not to say that. Ex-contestant, Dolly Bindra, also lashed out at him, on the social media on the same matter. #Priyanksharma what a shame on you. Talking about females with disrespect 🤢 You think you are a very big star??? I'm sure once you are out you will know the reality. @eyehinakhan you may be liked by classes but seeing your real side @11_Bigboss house people are disliking you. #PriyankSharma Just Body Shamed #ArshiKhan & #ShilpaShinde on National Television. This Man Never Learns From His Mistakes & His Apologies Ain’t Sh*t.